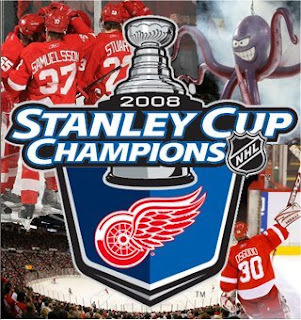 Congratulations to the Detroit Red Wings for winning the Stanley Cup last night!! The series was great this year (I thought), it is hard to see one team lose when they are both really playing their hearts out. To the Pittsburgh Penguins – great job! I was able to snap a quick picture with the boys by the cup (gosh, don't they look so young?). I was surprised at the size of The Stanley Cup and really humbled to think about all the hard work that goes into winning it. I still remember his words to this day. What a proud mom moment. That's an awesome pic. On my 'to do' list. p.s. Spencer is a star.